Abstract: Counteracting high failure rates in the development of new treatment strategies in oncology and improving therapeutic management of cancer patients requires preclinical models that can account for the complexity and heterogeneity of human tumours. Patient-derived cancer xenografts (PDXs) are developed by transplanting tumour fragments into immunodeficient mice. They maintain histopathological features and genetic profiles of the original patient tumours and are increasingly recognised as reliable models to predict treatment efficacy and discover sensitivity and resistance biomarkers with immediate clinical relevance. To effectively recapitulate and therapeutically interrogate the heterogeneity of human cancer, a dozen European cancer centres and university hospitals involved in translational oncology joined forces in 2013 to start EurOPDX, an academic research consortium that now gathers 18 institutions throughout Europe and in the US (www.europdx.eu). The goal of the Consortium is to maximize exploitation of PDXs and other patient-derived models for cancer research by: (i) integrating institutional collections into a multicentre repository now reaching more than 1500 models for 30+ different cancer types; (ii) defining common standards to improve the quality and reproducibility of oncology preclinical data; (iii) sharing models within and outside the consortium to perform collaborative precision oncology “xenopatient” trials. Building on its first successes, EurOPDX is now teaming up with other key academic and SME partners in a four-year project to build the “EurOPDX Distributed Infrastructure for Research on patient-derived Xenografts" (EDIReX project funded under EU’s H2020 research and innovation programme, grant no. 731105). This new cutting-edge European infrastructure will offer access to PDX resources for academic and industrial cancer researchers through 6 state-of-the-art installations or “nodes”. We will present the specific objectives of the project, including our work towards standardisation and optimisation of biobanking, quality control and data tracking, and the performance of in vivo drug efficacy experiments. Access to the resource, including the distribution of cryopreserved samples from established models, the structured biobanking of user-developed models and the performance of drug efficacy studies, will be offered through a grant application system to open in October 2018. Selection of the models by users will be made possible thanks to the newly-developed EurOPDX Data Portal, of which a prototype will be presented. 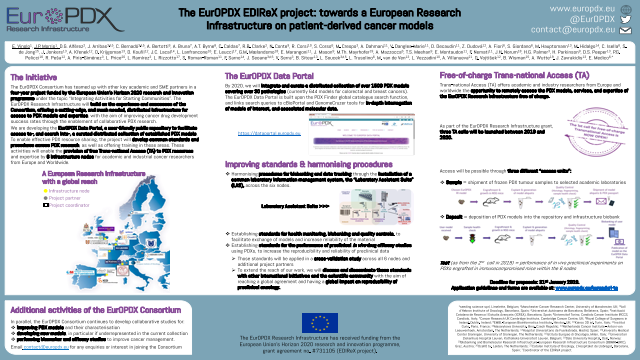 Through the EDIReX project we aim to improve preclinical and translational cancer research and promote innovation in oncology by integrating a European PDX repository and facilitating access to this much-needed resource for European and worldwide researchers. Summary: The EurOPDX Consortium has teamed up with key academic & SME partners in a 4-year project funded by the EU Horizon 2020 research & innovation programme. The EurOPDX Research Infrastructure will build on the successes of the Consortium, offering a cutting-edge distributed infrastructure for access to PDX models & expertise with the aim of improving cancer drug development success rates through the enablement of collaborative PDX research.